At the south end of the Space Coast is a length of beach linked to the famous conquistador Juan Ponce de León. I spotted the sign and nosed Red off the roadway. A ten-foot statue of the explorer's likeness was supervising the parking lot. Would you steal the ice-chest from the back of my pickup with this guy's eyes on you? Not likely. An historical marker indicated the name of the place: Juan Ponce de León Landing. I studied the sign. Its words swept me back in time. I was there all over again: smelling Mr. Plunket's classroom at Jefferson Elementary, watching his mustachioed lips tell stories of the discoverers, and later, snickering with schoolboy delight as me and the fellas lobbed wet toilet paper gobs against the bathroom ceiling. Splat! Splat! SPLAT! Who would have guessed that these experiences would shape me into the responsible citizen that I am today? The sign identified the place, more or less. Many of us learned in grade school that Ponce de León was among the first wave of Europeans to land in the New World, that he gave the place its current name (la Florida, meaning "land of humongous flying cockroach-bugs"), and that he discovered the Gulf Stream. We also picked up on the idea somewhere that this Christian Castillian spent an inordinate amount of time hacking through fetid jungles in search of the elusive "Fountain of Youth." Thwi-ick! . . . thack! Take that, you flying cockroach! Having lived in the region for a while now, I intuitively doubt parts of this narrative. For starters, it is unlikely that struggling through the muck of Disney's primordial swamp was truly "exploring" in any romantic sense of the word. It was probably something more akin to a feverish escape. Thomas Moran's classic "Ponce de Leon in Florida" (1878) captures thick green of live oak, vines, palmettos, and Spanish moss of Old Florida. Image from here. Real scholars have better reasons to doubt the narrative. As Matthew Shaer points out (find his excellent piece here), direct connections between Ponce de León's walkabout and the "Fountain of Youth" were not made until years after his death (and ironically, he died from the wound of a poisonous Indian dart while still young and full of vigor). More telling is the fact that Ponce de León was pushed out of the governorship of Puerto Rico by the son of Christopher Columbus. It may be that the real reason behind his Florida jaunt was the same stuff that has driven other lovely people to do very unlovely things: lust for wealth and power. Linking him to the fountain was a cheeky attempt to discredit his legacy. I can almost hear the voice of one of Ponce's critics, Oviedo Y Valdes: "Remember that gullible swamp dude all bit up by humongous flying cockroach bugs? If I were feeble like him, I'd look for a fountain too." Clearly, there is some locker room machismo at work here. Whatever the case, the myth of a rejuvenating fountain already had a long history in 16th century Europe. It was celebrated in story and art. By way of cheeky illustration, consider the work of Lucas Cranach the Elder, completed about twenty years after the death of Ponce de León. 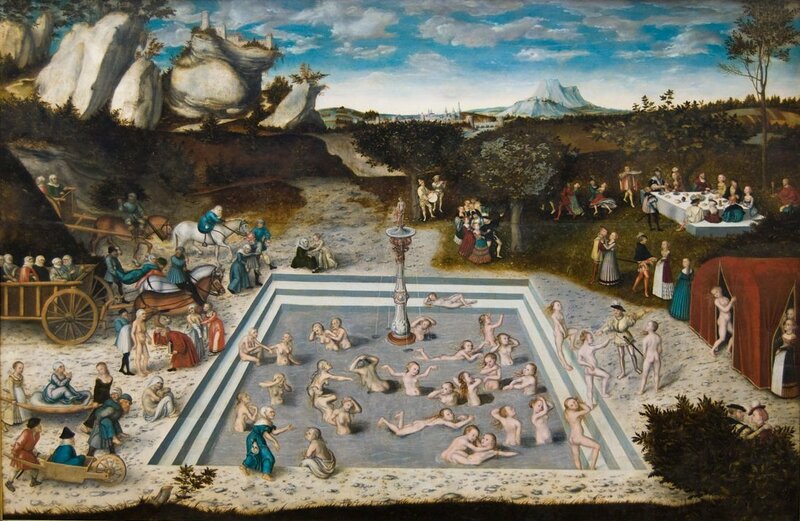 Lucas Cranach the Elder's "The Fountain of Youth" (1546). The fountain stands in the center of squared pool that somehow resembles a miqveh! Note the physical transformation of figures as they move from left to right. Pay no attention to the lovers in the bushes in the lower right. Image from here. Details within Cranach's work show stained old women arriving at the fountain on litters and carts.They emerge the other side, pink and fresh. Inside the tent they dress and step out as ladies ready for courtin'. The fellas line up to greet them. These images and other mini-scenes are from here. Vicki and I schlepped our gear into the sand just beyond the reach of the waves. We popped the little umbrella tent. She unrolled her towel and got comfortable. I ate the sandwich for breakfast that we packed for lunch. Then I peered into the Atlantic and imagined seeing Africa. I suspect that regular readers of Bible Lands Explorer are wondering what any of this has to do with the study of biblical backgrounds? Two ideas creep forward. The first is tied to contemporary notions held by Ponce de León and his explorer friends. By crossing the Atlantic, they did not realize they were scratching at the threshold of a whole new hemisphere, but rather, believed themselves to be sniffing the backside of the old. In other words, these intrepid fellows thought Hispaniola to be among the outlier islands of Asia, and more specifically, those of India (hence, we encounter terms like "West Indies" and "Indians"). Naturally, energy had to be expended to make sense of these discoveries without leaving familiar paradigms. For Christian Europe, such paradigms started with the Biblical Story. The New World raised many New Questions, but New Answers did not come easily. As just one example, imagine the challenge of placing these "Indian" peoples into the Story, i.e., how do they relate to Adam and Eve? Where do they fit in the Genesis genealogies? As one might expect, reports of unfamiliar tribes and tongues initiated a furious study of Old Texts (sticky note to self: how will students of the Bible handle future discoveries in outer space? We can only wince at the conundrums to come.). This portal transported us from the parking lot of Ponce de León's Landing to the beach. Just walking over it stripped away some years. A second idea of relevance rests in the search for holy places. Christopher Columbus himself took a swipe at the problem. Guided by the text of Genesis 1 and 2, he sought recognizable landmarks on the Caribbean horizon. He was not disappointed. The flow of the Orinoco River (located in modern Venezuela) was impressive enough to be identified with one of the four rivers of Paradise (attempts to identify the other three rivers would be made by his successors). Thus, for Columbus, the green tendrils rising from this sunset land were not those of a foreign landscape at all; it was quite literally the Garden of Eden. His was an expedition of rediscovery (I follow the lead of Daniel Boorstin in his The Discoverers [1983:242]. Just for the record, I want to be Daniel Boorstin when I grow up.). In light of this, one can only wonder about the most notable feature of that original garden: the tree of life. It presumably bore restorative fruit, which is why it had to be declared off limits to fallen humanity (Gen 3:22). But how did the fruit of youth and fountain of youth come to intersect? It is an interesting question for another time. I have a shrimp on my hook. It is a holiday after all. View north to the Space Coast from Ponce de León's Landing spot.